Curves can be a mystery to many photographers and photo enthusiasts when first learning Photoshop. Adjustments can be time consuming, and sometimes frustrating. Although if used effectively, curves can add amazing results to your photographs. Moreover, they lend a professional look to the photograph itself. Below is walk through on how to use one of the most confusing yet rewarding tools in Photoshop. Initial photograph opened in Photoshop. Minor edits have been made in Camera Raw to level tones. To access curves you want to select: Image > Adjustments > Curves (Ctrl+M). Ideally you will have already created a duplicate layer of the background in which to make your adjustment. 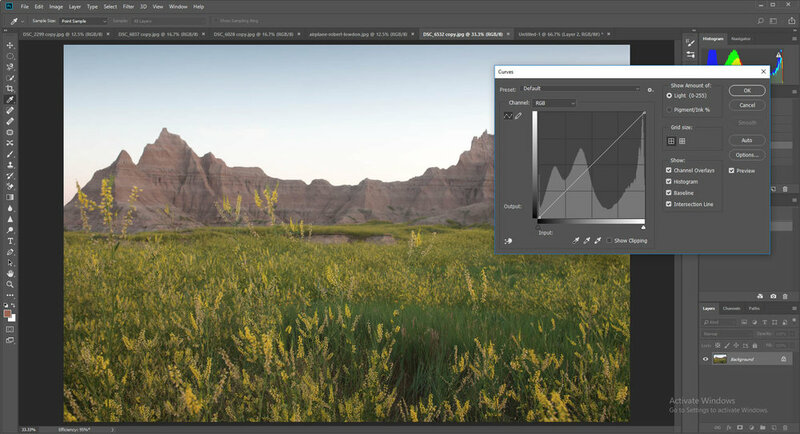 Some photographers might recommend that you create a new curves adjustment layer. I personally do not, as I do not care for the small dialogue box with limited functionality. Now that the curves window is open, you will want to select the button that resembles a finger. "Select the finger you must"
This allows you to to click on the specific tone in the image, and while depressing the left mouse button you can move the mouse up and down to adjust the exposure accordingly. You can also move left ot right to slightly modify the tone you have selected. This completely takes the guess work out of using curves. Click and hold on the area of photograph you want to adjust. Move the mouse up and down for exposure. You will now want to systematically go through all the tones across the histogram, adjusting them as necessary. Ideally you want a complete tonal range across your photograph with lots of contrast. It is quite possible that you can have 26 or more different markers when adjusting curves. Find out what works for you and tweak the exposure to get your desired result: A Beautiful Photograph.